The Look by Sophia Bennett A really enjoyable well-balanced story about two sisters, one’s talent spotted by a model agency, the other is diagnosed with cancer. Fifteen Days without a Head by Dave Cousins – Made me laugh, made me cry. Two brothers fight to cover up their mum’s disappearance. The author is American (but lives in the UK). The setting is America (but there’s a British character). Whatever. At Yellow Lake by Jane McLoughlin constantly amazed me with its brilliance. Categories: Books of the Year 2012 | Tags: Dave Cousins, H M Castor, Jane McLoughlin, Lydia Syson, Sophia Bennett | Permalink. 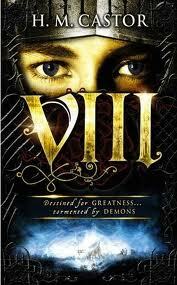 VIII is the story of Hal: a young, handsome, gifted warrior, who believes he has been chosen to lead his people. But he is plagued by the ghosts of his family’s violent past and, once he rises to power, he turns to murder and rapacious cruelty. Categories: England, Historical, Thriller | Tags: H M Castor | Permalink.